"Yau Yeng" or not? Handsome or not? Cool leh..So makan what to celebrate? Wahhhhh...brand new kiddy bowl and cutlery. This one I like! Very "seng muk". Without needing to request, they already gave me bowl and cutlery. Where are we? We were at Spice & Chill Noodle House at Kota Damansara (The Strand). As for drinks, Papa had Red Bean while Mamarazzi had Barley. Taste not bad. Just a tad too much sugar. But it's actually up to individual taste. Some like it sweeter. Mamarazzi ordered Pan Mee Soup. Smells very good and the "Su Chai Choy"(Cakur Manis) very young. Papa's bowl of Kon Low Pan Mee. Ngap! The fish ball very bouncy. I like. As for the Pan Mee? Slurppppeee delicious. Yummy. I can just keep on slurping it all in. Here is the address and opening hours just in case you would like to have a go at the delicious Pan Mee and check out what is Roasted Bread . Unfortunately they have pork I think. The minced meat. Can ask them not to put la...but not sure your friends mind or not. You crazy about Char koey Teow or not? The Sister's CKT at USJ is halal one and taste very delicious. I have blogged about it before. if not enough money, can hutang somemore. can ask to add extra ingredients here and there. Waaaa.... kepala licin liao. Kekekekeke... eh... roasted bread? Tak pernah dengar. Salah spelling kot? i think i will go for ngap ngap pan mee later.. droooooooling now..
lol send that to thumbnails again! pan mee is my favourite.. but kota damansara is not my hang out place.. huhuhu..
My Hubby loves Pan Mee. 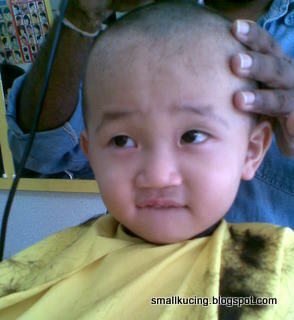 cut hair again = botak again?? haha, why mamarazzi don't want smallkucing to have handsome hairstyle?? eih, that pan mien looks nice leh, feel like having it for lunch later..
Aiya, cut botak again....must ask mummy to allow to keep hippie hairstyle lah look cool! Lots of this kind of places over there...usually not bad but I think for this kind of food, the best would be to hit the stalls and the coffee shops. Btw, why don't you try keeping your hair? I think you would look quite handsome... Hehehehe!!!! pan mee is my comfort food... can have it anytime anywhere :-D.
you got your hair cut, too! Here if ask this and that from hawkers will kena marah lo. Terbalik in posh place they dare not do that. Just the other day saw a fruit seller at the roadside scolding a Bangla from tasting the duku and asked RM1 from the Bangla. Depends gua...coz some who are muslim cant eat. Kenot keep longer hair now coz he very sweaty boy. Anyway already gave him a "tail" kakaka.. Ya loh...now Kota Damansara is a food hunt place already. Yup...sholin little ku fung master is on the roam again! Hi SK, love the dishes. Lee. this place only serve pan meen and "roast" bread? I think they translate direct from chinese that's why become roast instead of toast. hahahhahaha. The price for the toast look reasonable ya? Where Is My "K" ? A Little Bird Sent Me .....Shattered Hearts! Choo! Choo! Victoria Station Stop!